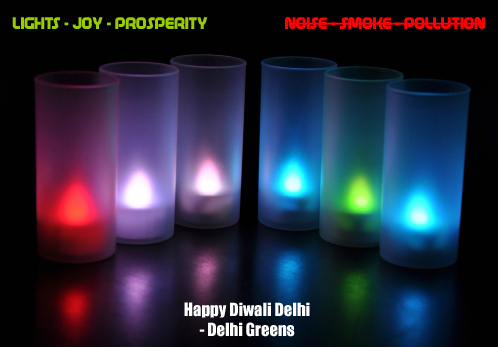 Can Delhi Afford to Pollute This Diwali? The festival of Diwali marks the victory of good over evil, light over darkness and knowledge over ignorance. The festival has always been an occasion for celebrating happiness, prosperity and well being of one and all. However, the situation in Delhi today is such that the celebrations revolving around this festival are becoming a threat to the health and well being of the society at large. Take, for example, the sweets which are manufactured and distributed specifically to meet the high demand during Diwali. The news of toxic laden ingredients as well as chemical treated dry fruits etc. becomes the talk of the town days before the onset of the festival preparations. The consumption of sweets and other eatables made from these ingredients leads to considerable loss of health and happiness, which has become an unfortunate part of the Diwali festivities. The most concerning aspect of the Diwali festival is the large scale use of wide array of firecrackers which contribute to smoke and noise pollution. The problem has been highlighted and greatly discussed around Diwali time in recent years. Delhi Government led campaigns with school and college children has helped reduce the menace of air pollution during Diwali in more recent years. However, the problem has a new dimension this year. Air quality in Delhi is at the worst that it has been and the city is already suffering from the ill-effects of air pollution. The even larger number of cars and other vehicles on the Delhi roads and an alarming 17+ million population of Delhi are two main reasons for this already escalated air pollution. A recent Central Pollution Control Board (CPCB) Report validates this and alerts Kolkata and Delhi to be the worst affected cities in terms of air pollution. As if things weren’t already concerning, Diwali this year arrives shortly after a press release made by the World Health Organisation (WHO) which is certain to add stress to the concern. Based on extensive studies by the specialized cancer agency of WHO, the International Agency for Research on Cancer (IARC), outdoor air pollution is now found to be a carcinogenic to humans. There is now sufficient evidence that exposure to outdoor air pollution causes lung cancer and also has a positive association with an increased risk of bladder cancer. Earlier this year, an India Today report had announced a study carried out by the Jawaharlal Nehru University (JNU) which concluded with the alarming finding that Delhi’s air is increasingly getting loaded with cancer-causing particles. IARC points out the predominant sources of outdoor air pollution as transportation, stationary power generation, industrial and agricultural emissions, and residential heating and cooking. All these pollution sources are found in Delhi and are only on the rise. The air quality in Delhi is already above the standards for healthy conditions as prescribed by the standardizing agencies like the Bureau of Indian Standards (BIS) and Delhi Pollution Control Committee (DPCC). We now know that air in Delhi is increasingly being laden with more and more cancer causing particles. The latter is happening to such an extent that media channels are now discussing how merely breathing in Delhi could cause cancer! To add fuel to the proverbial fire, Diwali festival has come at the onset of the winter season, when the heavier-cooler air is closer to the surface of the Earth and traps almost all the pollution. At the same time, the arrival of Diwali comes at a time when farmers in the agricultural dominant states around Delhi are burning the remains of the paddy to lay the ground for planting the next crop. The accelerated air pollution emissions on the Diwali night will only play havoc and could well push Delhi beyond the tipping point this year. The bigger question therefore is whether Delhi can afford to pollute this year? The answer is a straight and strict NO. If Diwali this year is anywhere as polluting as the Diwali last year, it could accelerate the rate of lung diseases, make it very difficult for those suffering from asthma and similar ailments and make a large population of Delhi prone to cancer. Unfortunately, preliminary investigation of real time air quality data of yesterday and today morning is already showing elevated air pollution levels in Delhi. There is thus either a lack of awareness of the severity of the air pollution crisis or a lack of understanding on the part of citizens on the consequences of their action. Every firecracker that is burnt in Delhi this Diwali, is a time bomb which will eventually explode and lead to large scale destruction of public health in the capital. It is for all of us to decide how many of such time bombs do we want to plant and for how long do we wish to keep our health secured. It has long been known that the metallic particles in the smoke emitted by fireworks pose a health risk, particularly to those who suffer from asthma. However, this Diwali, don’t just think of those asthma affected, sick and ailing patients but also think of the health and well being of yourself and your family. Here’s wishing everyone a very sensible, thoughtful and safe Diwali. PrevTo Keep the Trees Alive, It’s Becoming A Struggle Against the Civic Agencies. Why? It is disheartening to see how little concern we have for the environment. smoke and more smoke.